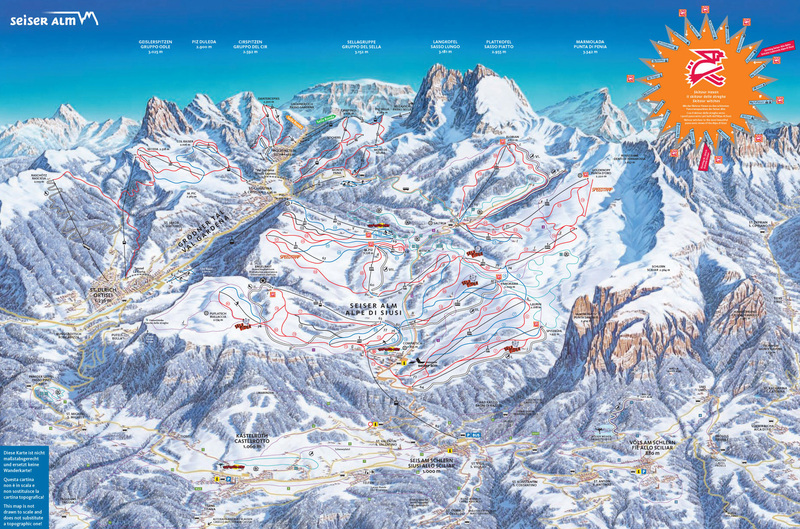 In terms of sheer breathtaking beauty alone, there are few ski resorts on Earth that come close to Alpe di Siusi. A winter sports mecca for those who demand more than just incredible runs and endless entertainment, Alpe di Siusi feels worlds away from the overcrowded and chaotic European staples. A gentler side of the regional tourism scene awaits, where commercial trappings are replaced by cosy atmosphere and an unmistakable feeling of authenticity. If you want to know a little more about Alpe di Siusi and how to access this wonderful resort, you’ll find all you need to know in this exclusive guide. Nestled right at the heart of the Dolomites, Alpe di Siusi boasts a UNESCO World Heritage backdrop on all sides. Despite some of the most extensive and epic runs in this part of Europe, Alpe di Siusi has somehow held onto its quaint and traditional charms. Amenities are first-rate in every way, but you never get the feeling it’s all simply fabricated for the benefit of visitors. 60km of slopes serve up the goods for every age and skill level, while the quality of the pistes themselves is arguably among the country’s best. Boarders are spoilt for choice, family fun is served up by the bucket-load and you’ll even have the chance to check out the meeting places of the legendary Schlern witches, while in town! We prefer to avoid flat pricing structures for customers looking to book Alpe di Siusi transfers. Instead, we take into account the specific needs of our customers individually, in order to ensure we offer the best possible value for money, every time. All of the above will only ever result in our base-rate for ski transfers going down – we never over-inflate our prices at any time or for any reason. We also offer substantial discounts for off-peak, off-season and midweek transfers to Alpe di Siusi. If looking for the best possible deals, travelling outside peak season or midweek typically results in the biggest savings. We offer midweek (Monday to Friday) prices with up to 60% discount than weekend prices. Alpe di Siusi is famed for providing an equally incredible experience for all skill levels across the board. From first-timers to seasoned pros, there’s plenty on offer for everyone. Kids are catered to generously by not only an array of super-gentle slopes, but also some of the most fantastic ski schools in the region. There’s also more than enough to keep kids of all ages entertained off the slopes, which is always a bonus for visiting families. Alps 2 Alps is committed to delivering the total package of high-quality resort transfer services and the lowest possible prices. When it comes to reliability, punctuality and flexibility, you won’t find a better deal out there! Book in advance to benefit from the lowest possible prices and total peace of mind. As always, be sure to get in touch with the team if you can’t find the resort or the service you require listed on our website. If you want to get your trip to Alpe di Siusi off to the best possible start, you know who to call!